Alannah Hurley | UTBB Oct 17, 2018.
Who: Leaders from organizations across the state will make brief comments and calls to action. Co-hosting organizations include Native Movement, United Tribes of Bristol Bay, the Alaska Native Women’s Resource Center, Chickaloon Village Traditional Council, Native Peoples Action, Arctic Winds Healing Winds, Gwich’in Steering Committee, Alaska Network on Domestic Violence and Sexual Assault, Southeast Alaska Indigenous Transboundary Commission, The Alaska Center, Forget Me Not, the Fairbanks Climate Action Coalition, and Alaska Community Action on Toxics. Summary: United under the banner of “Defending the Sacred” Alaskan groups from across the state have joined together to rally on the opening day of the 2018 Alaska Federation of Natives convention. The message is a call to action for an end to the violence against women and children and an end to the degradation of Alaskan lands & waters. The rates of missing & murdered Indigenous women and girls in Alaska is staggering, and many go unreported or unrecognized. Alaska Native women have the highest rates of sexual violence “than any other gender or racial group in Alaska, comprising 42% of all reported victims” (2017, Alaska State Public Safety Report) . In 2016 the number of reported missing American Indian and Alaska Native women was at 5,712 (National Crime Information Center). Recent tragedies in Alaska further underscore the state of emergency Alaska’s Indigenous women and children face. The murder of Ashley Johnson-Barr, 10, in Kotzebue and the lack of justice regarding Justin Schneider’s kidnapping and sexual assault in Anchorage. Groups rally on Thursday to say “enough is enough, we demand justice; our bodies are sacred, our people are sacred. The coalition also highlights the need to protect lands and waters, given the continual threat of irresponsible resource extraction projects, past and current harm caused by militarization, and worsening climate change. In 2014 the rural Alaska wild food harvest was approximately 34.3 million pounds, an average harvest of 275 pounds of wild foods per person annually. Wild foods provide 175% of daily protein requirements and 25% of caloric requirements in rural Alaska (Fall 2016). Alaska lands and waters provide for our Alaskan ways of life, our spiritual foods, and our wellness. 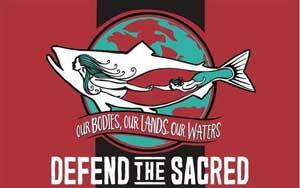 Defend the Sacred AK is a broad coalition of community groups and individuals from across Alaska joining together to protect our greatest resources: Our Bodies, Our Lands, and Our Waters.